During early 1942, it became apparent that the T-60/T-60A light tanks were too lightly armoured and that its armament wasn’t sufficient enough to cope with the new German tank models. It was by this time when the new T-70 tank appeared, which was built at the Gorki Automobile Works. The T-70 started to replace the T-60 in late January 1942. Using the same chassis with a front drive slightly reinforced to take the extra weight, the turret was redesigned and welded, and it mounted a 45 mm gun and a coaxial 7.62 mm DT machine gun. 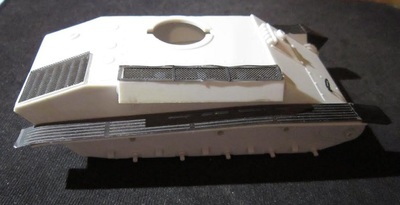 The new turret had a semi-circular hatch in the turret roof, and a curved external mantlet with a sleeve for the gun. To give cleaner outline and better protection the hull armour was modified, and the driver was provided with an armoured visor. Compared to the T-60, the engine power was doubled by providing two engines of the Soviet 110 hp Hudson straight-eight car engine. Twin guide-horns on each track plate, and the T-70 could attain a maximum speed of 32 mph. A lipped air-intake was welded below the turret on the right side of the hull, and an engine-servicing hatch was fitted to the right side of the glacis plate. In the summer of 1943, the T-70A appeared, with increased armour and slightly more powerful engines. The turret had a squared-off rear, as distinct from the rounded type of the T-70, and had welded strengtheners along the joints. Production of both models ceased in late 1943, partly due to its poor combat performance. Its main shortcoming was that the commander also had to act as the loader and gunner, which reduced the tanks speed of engagement. Nevertheless, a total of 8,226 T-70’s of all types was built during the war. During 1944, many T-70 chassis were converted to self-propelled mountings for 45 mm anti-tank guns, captured 47 mm Czech anti-tank guns, and later for the new 57 mm and 76.2 mm anti-tank guns. Toga is an umbrella organization of Modellbau Tom of Germany, which picks up stray kits from eastern European manufacturers and markets them under their own Toga brand. Most of their kits thus far have come from Poland and Moldova, and the T-70 is one of the Polish efforts. Copyright date was 1996. 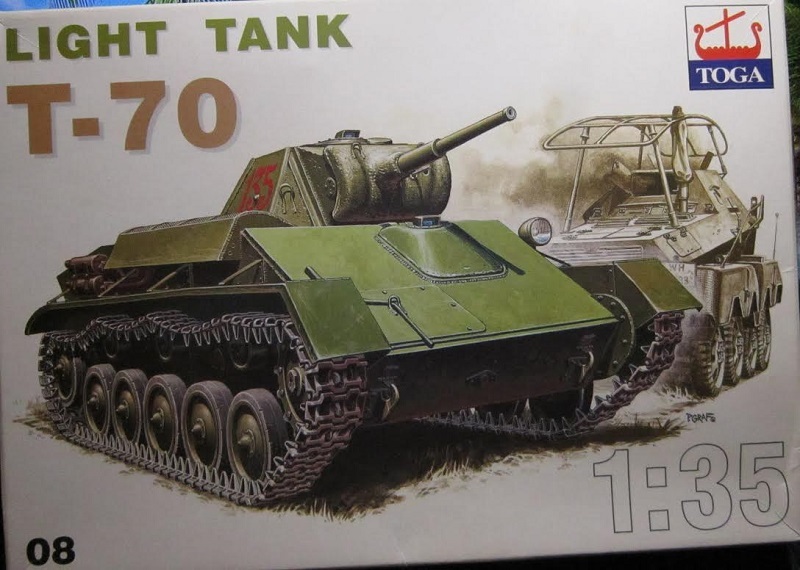 The box art shows a T-70 parked on grass with a knocked-out German Sd.Kfz. 232 8-wheeled radio vehicle in the background with smoke coming out of it. The T-70 is in overall Soviet dark green with a red turret number 135. This is all posed against an all white background, similar to how Tamiya does all their box arts. Both of the side panels of the box says the kit was made in Germany and molded in Poland, followed by Toga Ltd’s street address in Germany. 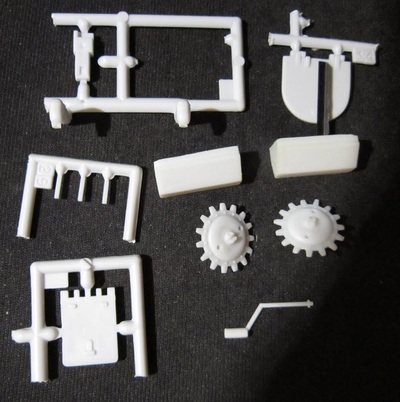 The kit is said here also that it is intended for modelers 7 and above. This kit contains 2 pale gray parts trees and 2 chalk-white trees, a loose pale gray rear body panel part, a section of plastic screen to use over the engine air intake, the decal sheet, instructions and a small kit catalog dated 1996. Parts are not cello bagged. The instructions consist of a single sheet that is folded in the center to create 4 pages in 5 ¾” x 8 ¼” page format. Page 1 begins with a small black and white repeat of the box art, followed by the history of the T-70 in German and English. Page 2 & 3 give a total of 6 assembly steps, that are labeled with Roman numerals. Page 4 has 2 side views and a top view for 2 schemes. The first scheme is the box art one. 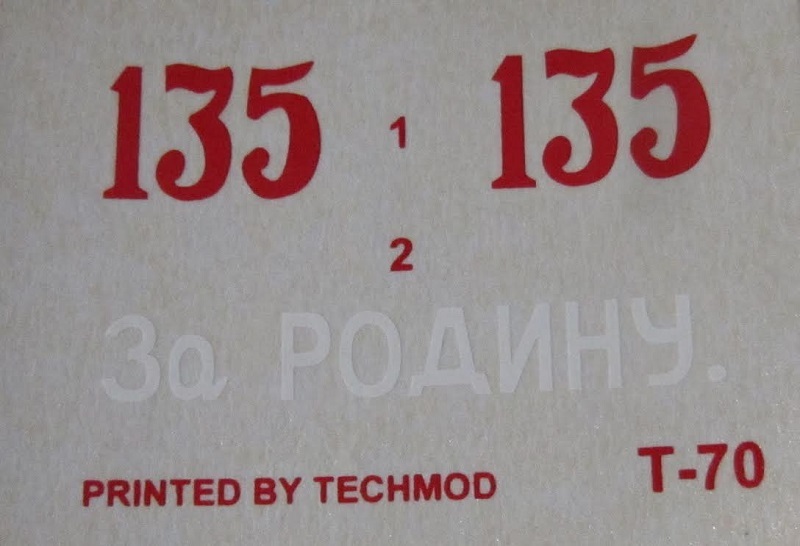 Overall Russian green (Humbrol 114 brand paint) with the red turret number 135. No unit is mentioned. The second scheme is just the overall Russian green, with a white slogan on the right side of the hull that translates into “For Russia”. Again no unit is said. The 1996 kit catalog is also a single sheet folded in the center to create the same 4 5 ¾” x 8 ¼” page format. Black and white illustrations of box arts are shown for 39 model kits that Toga markets. The majority are AFV’s, but 2 are aircraft. Toga’s distributors in France, the Baltic States, Hong Kong, Sweden, Italy, Slovenia, Japan and the USA are shown with their street addresses. The loose pale gray hull rear plate is next. The final part is the plastic screen to use as the grill over the engine air-intake opening. I purchased the Eduard PE set designed for this tank (Kit no. 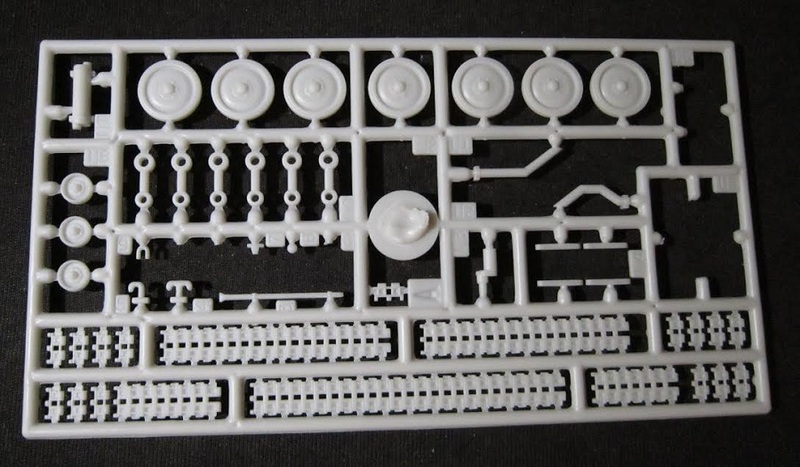 35226) and am using the fenders, engine air–intake screen and other small fittings from it. 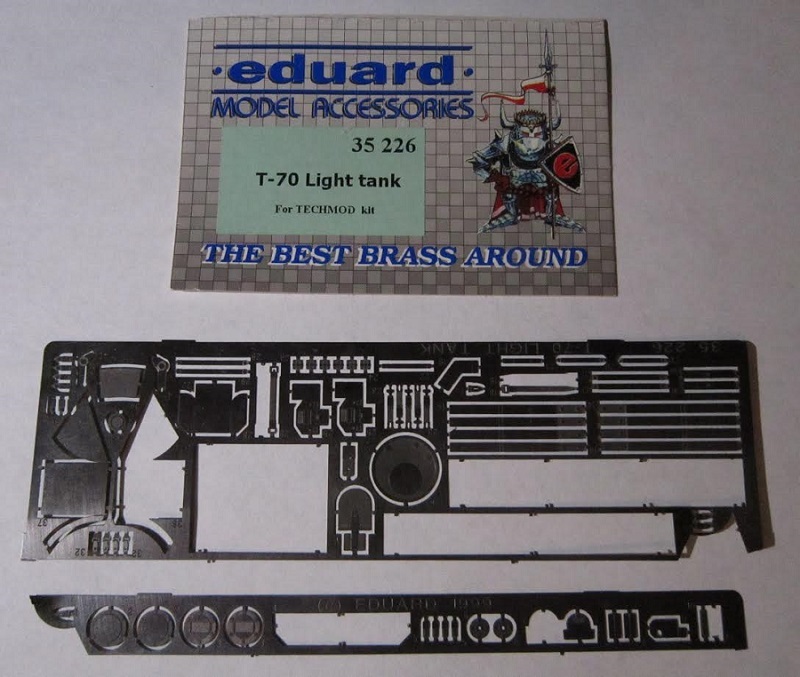 The kit provides both early (T-70) and the late production (T-70M) driver-mechanic’s and commander’s hatches. The former are smooth, the latter are equipped with rotating periscopes. It also has the early production T-70 exhaust. However, there is no option to install the later (and more common) T-70M exhaust or the final T-70M/T-80 armored exhaust. The tracks are the user-friendly link and length type. There are no crew figures, clear parts or any interior detail included. This kit makes up into a nice small tank and the external detail is nice. Very petite in places. I have started to assembly my T-70 and have added some of the Eduard PE to it: the air intake screens, fenders and lift rings. The turret is all together and the hull bottom, sides and top are in place. I have to add the figure 8 shaped bogies, road wheels, drive sprockets, return rollers, drive sprocket arms, radio antenna, exhaust, storage bins on the left rear fender etc. yet. 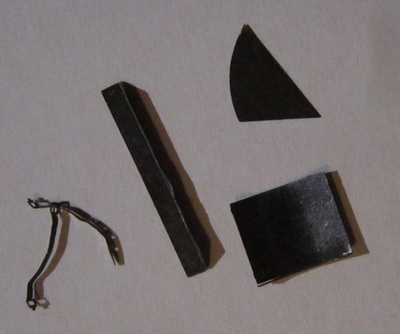 I purchased my kit at my local hobby shop back in the 90's. Recommended to modelers of average building skills.